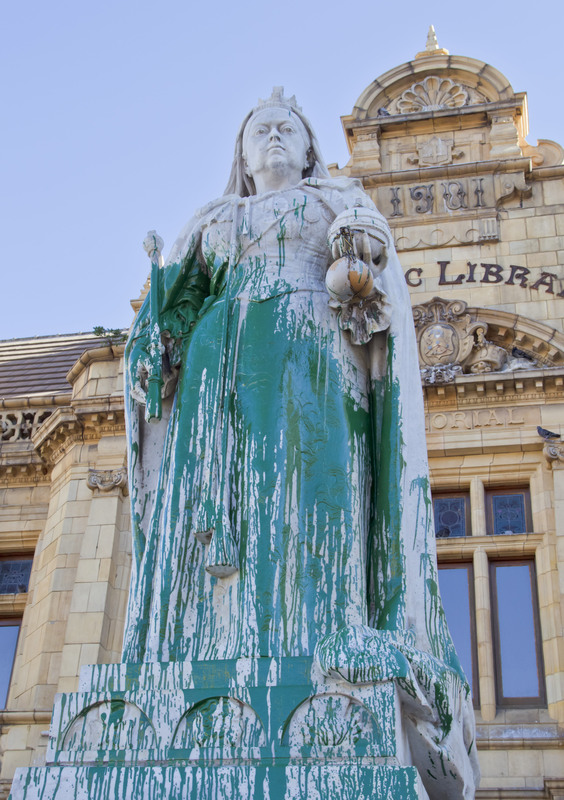 In this photo taken Friday, April, 10, 2015, a statue of Britain’s Queen Victoria, outside the Port Elizabeth city library in South Africa, after being splashed with green paint. Excrement thrown at the statue of British colonialist Cecil John Rhodes began a wave of vandalizing protests in South Africa. Memorials to South Africas colonial past were rejected as symbols of oppression by mainly young black protesters, as statues of British monarchs Queen Victoria and King George V were splashed with paint, in the cities of Port Elizabeth and Durban respectively. JOHANNESBURG (AP) — Excrement thrown at the statue of British colonialist Cecil John Rhodes began a wave of vandalizing protests in South Africa. Memorials to South Africa’s colonial past were defaced by mainly young black protesters, as statues of British monarchs Queen Victoria and King George V were splashed with paint, in the cities of Port Elizabeth and Durban respectively. Founding fathers of Afrikaner nationalism were also targeted. In Pretoria, the memorial of 19th century Afrikaner leader Paul Kruger was twice daubed with bright green paint, while the statue of Marthinus Pretorius, who founded the capital city, was splashed with reddish brown paint, according to local media reports. The statue of Louis Botha, the president of the South African Union in the early 1900s, was smeared with red and blue paint outside parliament in Cape Town on the same day that the Rhodes sculpture was removed from its perch overlooking the University of Cape Town, after weeks of student protest. In the Free State province, a statue of Boer General Jan Fick was splashed with red paint in the town named after him in 1883, Ficksburg. Vandals poured paint over Scottish-South African missionary Andrew Murray’s statue in the Western Cape. War memorials were also defaced. A bronze rider marking the Anglo-Boer War from 1899 to 1902, was toppled from his horse. In the latest demonstration, vandals smeared paint the figure of a young Mohandas Gandhi. Standing in the square in downtown Johannesburg named for Mahatma Gandhi, the memorial marks the Indian anti-colonial leader’s time in South Africa, where he formulated the principle of passive resistance. The protester, who smudged white paint on Gandhi’s cloak, accused him of being racist during his time in the country. Several people have been arrested and local authorities have spent thousands of dollars cleaning up the statues. The opposition party, the Economic Freedom Fighters, has come out in support of its members who have claimed responsibility for these acts of vandalism. While the string of protests has sparked a national debate about how to remember South Africa’s troubled past, another question about the statues is gaining ground in the country: Who’s next? Tags: South Africa, statues, vandal. Bookmark the permalink.